Citi UAE opens Citigold lounge in Abu Dhabi. 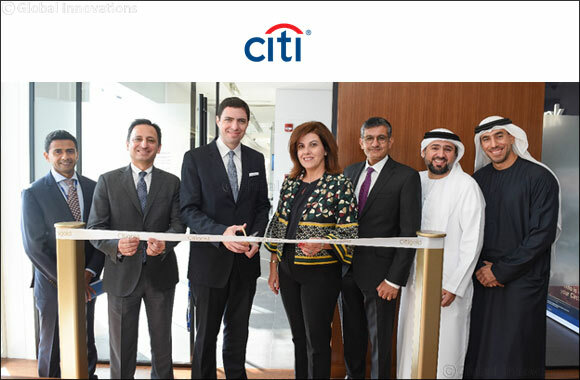 Abu Dhabi, UAE, January 14, 2019: Citi UAE announced the opening of its Citigold Lounge in Abu Dhabi designed to provide enhanced professional wealth management services across the UAE. The centre was inaugurated at a ribbon cutting ceremony attended by: Gonzalo Luchetti, Citi EMEA and Asia Head of Consumer Banking; Elissar Farah Antonios, Citi UAE Chief Country Officer; Dinesh Sharma, Citi Middle East Head of Consumer Banking; Venkat Mahadevan, Citi Middle East Wealth Management Head; Mohammad Ali Abdulla, UAE Wealth Management, Branch Banking Sales and Distribution Head, Ganapathy, N, Market Head – Abu Dhabi and Kiani Abbas, Branch Manager & Team Leader – Abu Dhabi Branch. Located in Najda Street, Abu Dhabi, the Citigold Lounge covers close to 2,700 square feet and is equipped with private meeting rooms, three ATMs, as well as facilities to host client events and investment research updates. The new lounge is now open for business. The center will also be a hub for over 12 trained wealth management relationship managers and portfolio counselors, who will be able to assist clients with their wealth management needs in private meeting rooms. Clients will receive personalized wealth management services from experienced relationship managers, who will handle only a small number of clients to enable them to pay close attention and tailor services to suit individual clients. Clients will also be able to apply for a credit card, investment and insurance products, open a new account or review the performance of their current investments. Gonzalo Luchetti, Citi EMEA and Asia Pacific Head of Consumer Banking, said, “Abu Dhabi has been a key market for Citi, since we first opened our branch in 1971. HNWIs in the region have developed the need for sophisticated financial services and the UAE is a market with tremendous potential. We continue to see growth both with our institutional and consumer clients here and as Abu Dhabi continues to realize its 2030 Economic Vision, Citi remains poised to deliver our best to our clients’’. Citi UAE offers wealth management services, digital banking and solutions tailored specifically to the unique needs of affluent customers. Citigold customer preferences are becoming more global, digital and oriented towards savings and investment solutions, customers increasingly want to bank digitally while still having the flexibility to receive wealth management advice from a team of trained individuals. The Citigold proposition is a premier solution designed to meet the global banking and investment needs of affluent individuals with investable assets of USD 200,000 (or in equivalent currencies) and above, the proposition offers both wealth management advise as well as life style benefits to meet the expectations of our discerning clientele. Citi also recently announced that it has been granted a license by Abu Dhabi Global Market (ADGM) to set up a branch of Citibank NA at ADGM. The new Citi branch will be set up at ADGM, an eminent international financial centre in the capital of the United Arab Emirates with a robust regulatory framework, and will provide cutting-edge liquidity management solutions to Citi’s clients looking to establish regional Treasury centres in the UAE. Upon receiving final approval from the Financial Services Regulatory Authority (FSRA) of ADGM, the branch will also offer the full suite of Citi’s institutional banking capabilities to its global clients. This augments Citi’s capacity in the UAE where the global financial powerhouse has been operating a universal banking model encompassing wholesale and retail banking activities since 1964.